Affiliation: Institute of Quantum Electronics, ETH Zurich, Switzerland. Quantum network architectures consist of local nodes comprising quantum memories that are interconnected using single photons propagating in photonic channels. In such networks, the ability to transfer a quantum bit of information (qubit) from one node to another plays a central role. In a practical implementation, the photonic qubits are generated through spontaneous emission from a matter qubit – embodied for instance by a single atom or ion, a point defect or a quantum dot in a solid-state matrix. The generated photons are then collected in a fiber and sent to another matter qubit using a photonic channel. Since photonic channels are subject to imperfect collection efficiencies and photon losses, there is a finite probability that such a state transfer based on a single photonic qubit fails. It is therefore suitable to have a heralding signal testifying that the transfer has been successful. Although some basic elements towards such heralded quantum state transfer have already been demonstrated in previous work using various physical systems [1-4], a full node-to-node heralded transfer using single photon qubits has not been achieved to date, mainly due to the dominant role of photon losses. Using self-assembled semiconductor quantum dots (QDs), we have demonstrated heralded absorption of a neutral (source) QD generated single photonic qubit, by a single-electron charged (target) QD that is located 5 m away . The photonic qubit is thereby transferred and stored in the spin degree of freedom of the single host electron. A successful process is heralded by detection of a subsequent photon that carries no information about the qubit state, which is essential to preserve the coherent quantum superposition. The principle of our experiment is depicted in fig. 1. The source QD (QD1) is neutral and can be prepared in an arbitrary superposition of two exciton states using a two-color laser beam. This quantum state is encoded in the color of a single photon (flying qubit) generated upon radiative recombination of the QD1 exciton. This flying qubit is collected into a fiber and transferred to the target QD. Amongst the wide variety of QDs that are randomly formed during the growth of the sample, the target QD has been carefully selected to have a specific energy level scheme presenting two transitions of identical energies, such that photons emitted after absorption of the photonic qubit carry no information about the decay path. As a consequence, if the spin state is initially prepared in the superposition state |up> + |down>, upon absorption of the photonic qubit and detection of the subsequent photon, the electron spin ends in the qubit state generated by the laser excitation of the source QD. 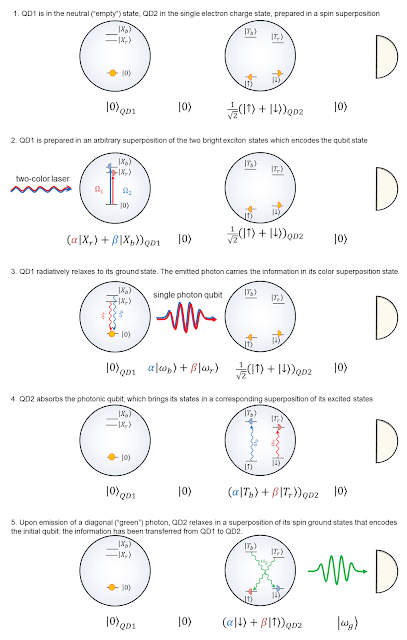 Figure 1 : (Click on the image to view with higher resolution) Principle of the state transfer protocol based on heralded absorption of a single photon qubit. Implementing such an experiment is particularly challenging due to finite collection efficiencies and losses in the optical elements along the chain. One of the key elements that have allowed our realization is the use of a photonic structure enabling efficient extraction of the emitted photons. More specifically, the QDs are embedded in a planar cavity and the cavity output is collected using a solid immersion lens placed on top of the sample, ensuring that about 20% of the photons from each QD are collected by the first lens. The use of sensitive superconducting single photon detector with very low dark counts as well as crossed-polarization detection to suppress the strong pump laser light and background scattering have allowed us to demonstrate heralded absorption where we detected up to about 100 successful events per second. We demonstrated that the final state of the destination quantum dot spin is correlated with the initial state of the photon (or the target QD exciton) by measuring time-resolved photon coincidences. Our scheme can be extended to realize spin-to-spin state transfer, or to generate heralded distant entanglement between two QD spins . It can also be used to connect dissimilar physical systems in the context of hybrid quantum networks . Stephan Ritter, Christian Nölleke, Carolin Hahn, Andreas Reiserer, Andreas Neuzner, Manuel Uphoff, Martin Mücke, Eden Figueroa, Joerg Bochmann, Gerhard Rempe, “An elementary quantum network of single atoms in optical cavities”, Nature, 484, 195 (2012). Abstract. Christoph Kurz, Michael Schug, Pascal Eich, Jan Huwer, Philipp Müller, Jürgen Eschner, “Experimental protocol for high-fidelity heralded photon-to-atom quantum state transfer”, Nature Communications, 5, 5527 (2014). Abstract. Norbert Kalb, Andreas Reiserer, Stephan Ritter, Gerhard Rempe, “Heralded Storage of a Photonic Quantum Bit in a Single Atom”, Physical Review Letters, 114, 220501 (2015). Abstract. Sen Yang, Ya Wang, D. D. Bhaktavatsala Rao, Thai Hien Tran, Ali S. Momenzadeh, M. Markham, D. J. Twitchen, Ping Wang, Wen Yang, Rainer Stöhr, Philipp Neumann, Hideo Kosaka, Jörg Wrachtrup, “High-fidelity transfer and storage of photon states in a single nuclear spin”, Nature Photonics, 10, 507 (2016). Abstract. Aymeric Delteil, Zhe Sun, Stefan Fält, Atac Imamoğlu, “Realization of a Cascaded Quantum System: Heralded Absorption of a Single Photon Qubit by a Single-Electron Charged Quantum Dot”, Physical Review Letters, 118, 177401 (2017). Abstract. D. Pinotsi and A. Imamoglu, “Single Photon Absorption by a Single Quantum Emitter”, Physical Review Letters, 100, 093603 (2008). Abstract. 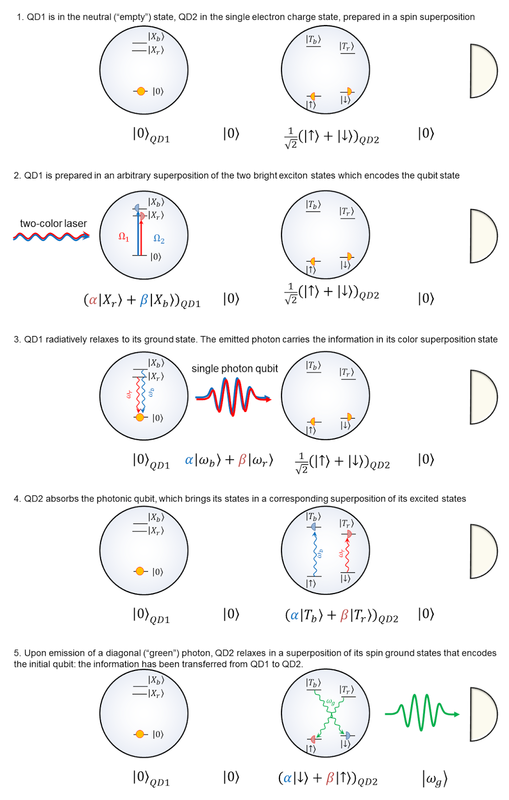 H. M. Meyer, R. Stockill, M. Steiner, C. Le Gall, C. Matthiesen, E. Clarke, A. Ludwig, J. Reichel, M. Atatüre, M. Köhl, “Direct Photonic Coupling of a Semiconductor Quantum Dot and a Trapped Ion”, Physical Review Letters, 114, 123001 (2015). Abstract.